Blizz Richards is a great guy, a caring boss, and a loyal friend. Oh, yeah...he's also a yeti! He's made it his life's mission to study cryptids like him, hidden animals who have taken a powerful oath to never be seen by the outside world. 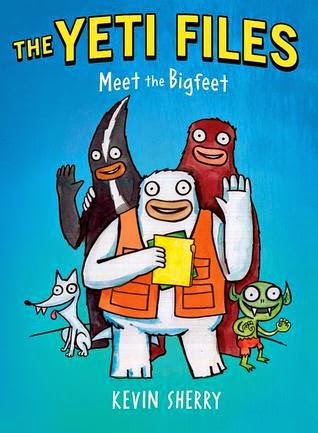 In Kevin Sherry's hilarious new illustrated series, you'll meet a wide array of weird and wacky cryptids, from goblins and Goatman to skunk apes and Sasquatch--animals that you don't believe exist. And it's up to Blizz to keep it that way! I Loved the drawings and the fonts. The characters are designed really well. The inside of a Yeti is fantastic (the anatomy of one). This book is informative? (Even for an imaginary creature). I guess I'd say the information given is from folklore and who doesn't love learning about that? The Yeti, that mythical creature (what they call a cryptid – a hidden animal whose existence was never proven), I think it’s time for him to be in the spotlight. Move over gnomes and cats, the Yeti is here to stampede all over you. I wonder if all those Bigfoot shows on T.V. have sparked an interest with the wee little ones? No matter the case, I can see the bigfoot/yeti being the next big thing. What will this graphic novel for kids include? How about a Yeti cave that resembles the “bat” cave from Batman (chock full of fun gadgets and goodies)? Yep, it’s got that. What about a Yeti family reunion? Definitely. The book even has a little “on the edge of your seat” drama. Don’t want to give it away… that wouldn't be much fun. I can just imagine most kids who read this will become obsessed with “looking for bigfoot”. Although, would that be so bad? It would be a fun outdoor activity! My favorite character in all of this, Gunthar, (super annoying and loves anything that bothers Alexander the Elf) I adore him. The Author/Illustrator is very talented and has a great idea brewing with this. I can see this becoming a big series (Bad Kitty-esque?). Need a good gift for a kid? Want them to read more? This is pretty perfect. P.S. - This book was sent to me by the publisher for my honest review.